While shiny new graphics cards, and the latest multi-core monster CPU can boost the visuals of your online gaming, they do very little to help your actual gaming performance, with no way of enhancing your aim and movement techniques. This is where gaming mice come in, offering ridiculously high sensitivity, adjustable weights and more buttons than the NASA space center. Today we will be looking at a product from a new comer to the OC3D labs - Revoltec. With an impressive looking lineup of high end mice listed on their website, we though it was about time we had a look at one. Revoltec produce a range of computer hardware, such as cases, cooling, hard drive enclosures and input devices. Unfortunately their site doesn't contain any substantial company information, only this short snippet of information offered an insight into the company. 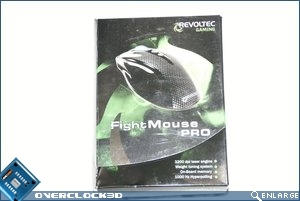 The Revoltec FightMouse PRO comes equipped with a laser sensor capable of handling up to 3200 dpi. The additional weights provide for Customized handling. The dpi switch integrated beneath the scroll wheel makes it easy to change between the 4 custom-definable dpi levels. The colour of the scroll wheel signalises the currently selected dpi level. 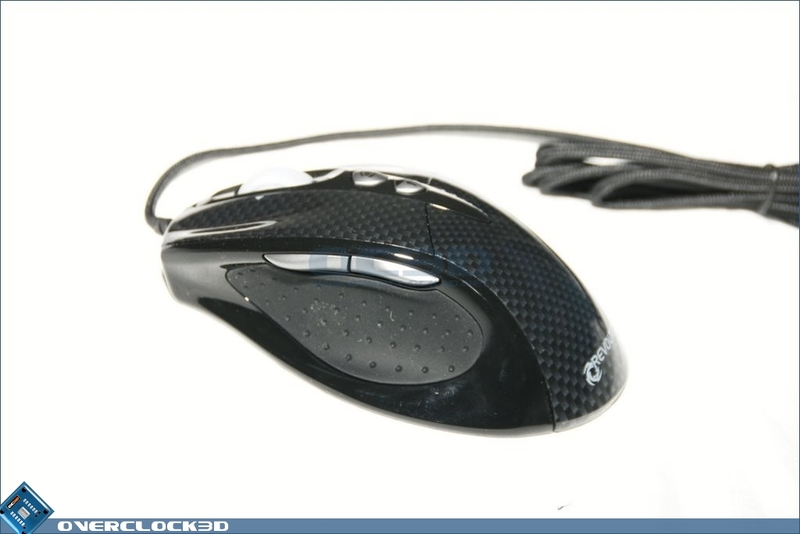 The mode button allows the user to switch between mouse profiles, which can be freely customised using the software. The included software allows for 8 of the 9 buttons to be custom programmed. 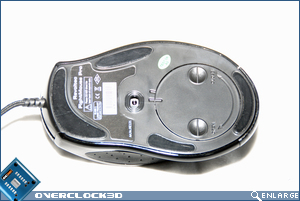 Up to three different mouse profiles are also available. 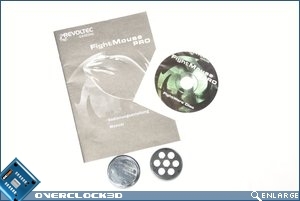 These are stored in the Revoltec FightMouse PRO's 8kb of on-board memory. 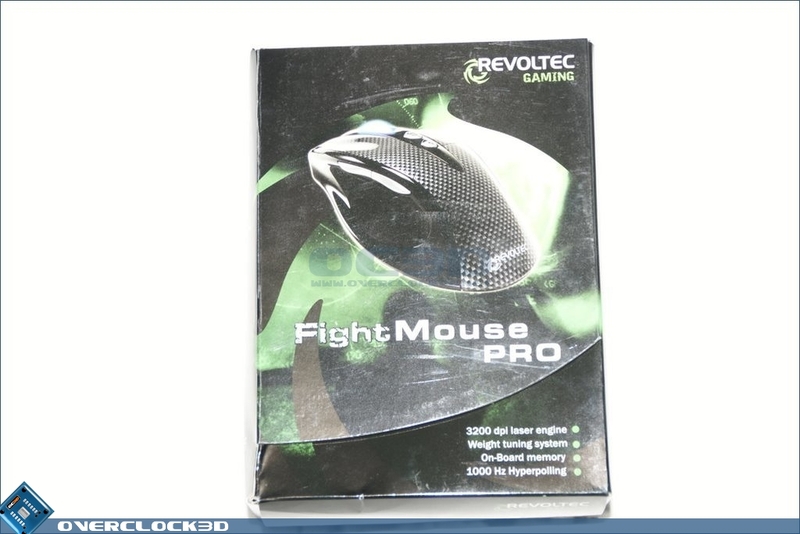 The underside of the Revoltec FightMouse PRO features a compartment for up to seven 20g weights. 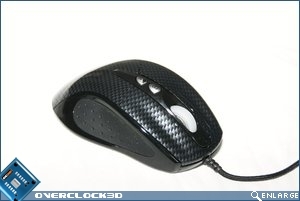 They can be added in to change the weighting of the mouse, providing a individualised gaming feel. 3200dpi may no longer the highest around, but sensitivity any higher is only normally seen on mice approaching the £75+ mark. The on-board memory could prove extremely useful for gamers that regularly attend LAN parties, allowing them to save their customized keys on to the mouse rather than having to set them all up again on arrival. The final headline feature has got to be the adjustable weights, which seems to be the 'in thing' at the moment, but we will have to see how well they perform in later testing. 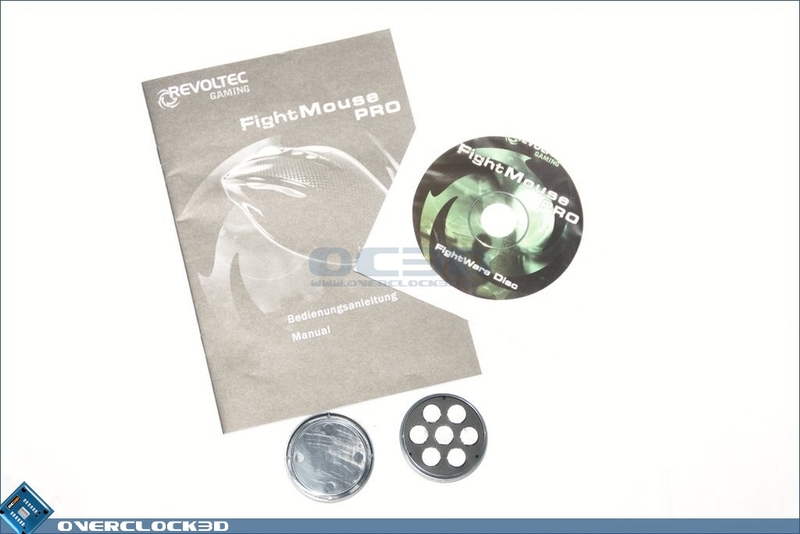 As with most products, appearance plays an important part in making a product truly desirable, with that in mind we took a close look at the FightMouse. The packaging has a small, velcro latch door, which means you can see the product prior to purchase, which is a nice addition. 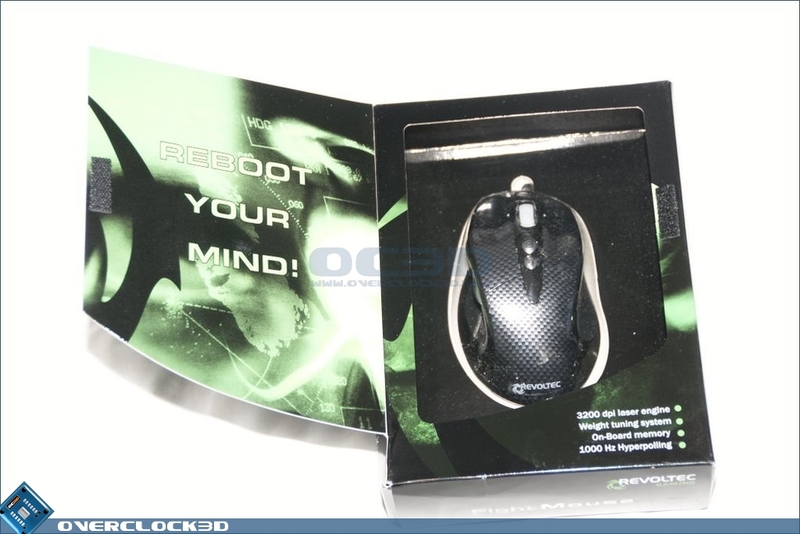 It shows that Revoltec have put an extra bit of thought into the packaging, rather than just sticking it in a box. 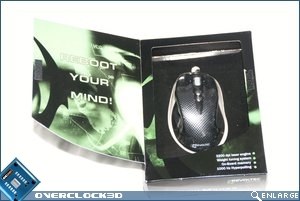 The box has a green/black graphic, with the mouse and various key features listed on the front. By opening a flap placed at the top of the box you can pull out the tray containing all the goodies. 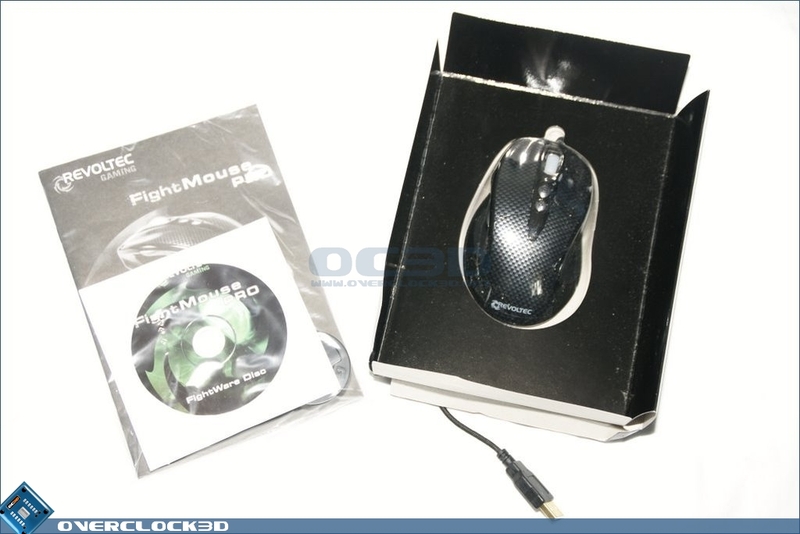 Included with the FightMouse is a user guide/manual, 'Puk' with 7 optional weights and a driver disk. The Puk will prove useful if you don't use all the included weights, and it's nice of Revoltec to come up with somewhere safe to store them. With the packaging out of the way, lets take a look at the product itself. 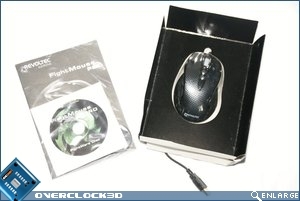 The mouse follows a fairly standard layout, with your normal left and right click, mouse buttons 4 and 5 on the left hand side and a scroll wheel in the center. The scroll wheel is no ordinary scroll wheel though; it can also scroll left and right, providing you install the bundled driver. 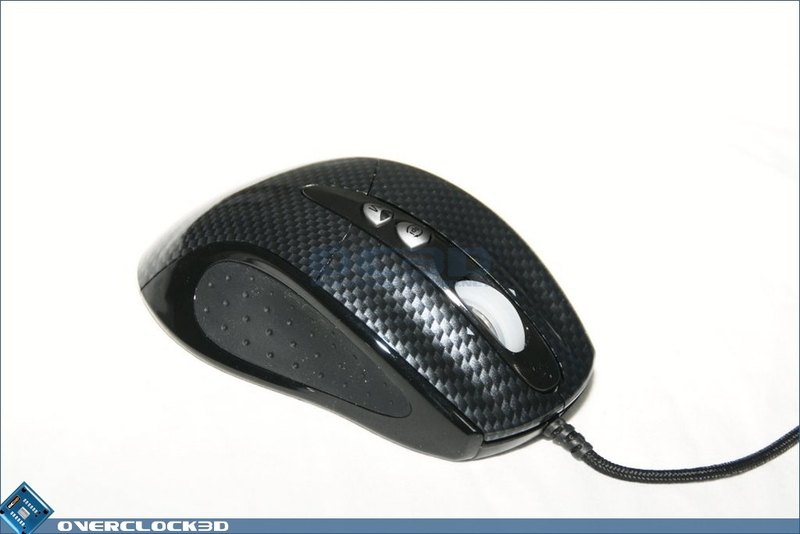 The mouse's grip is a fairly soft rubber, which provides a tight but comfortable grip. 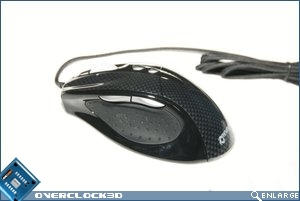 The shell is covered with a carbon fibre effect, but it falls short of looking realistic and is the only aesthetic quibble we have with the mouse. It's a shame Revoltec didn't perfect the carbon fibre look a little more, as it would have rounded off the aesthetics very nicely. 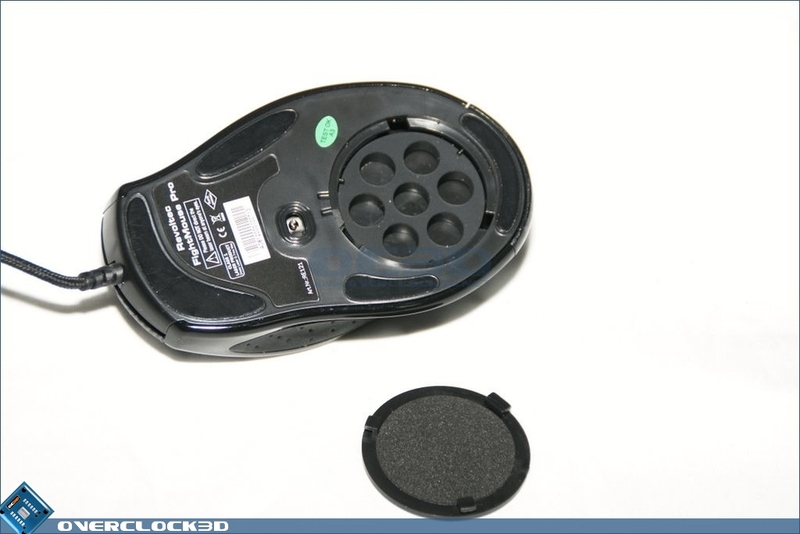 On the bottom of the mouse we have the contact pads, tracking laser and a little hatch for inserting the included weights. The pads create a nice amount of friction - enough for accurate control whilst not being too stiff. 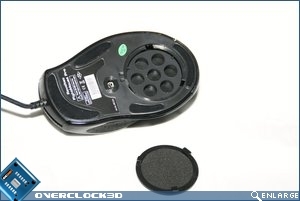 The mouse was also incredibly smooth: Revoltec seem to have got the contact pads just right. 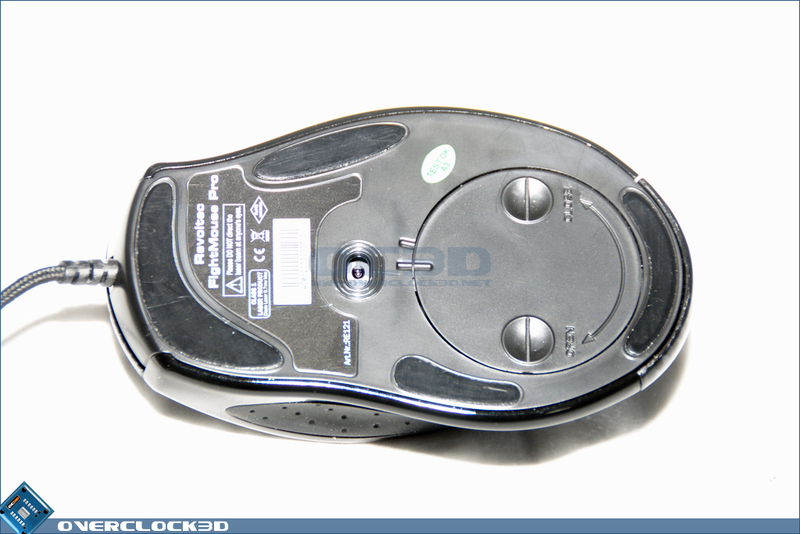 You can remove the weight hatch by twisting it clockwise, allowing you fine adjustment over the weight of the mouse. I just registered for that. It's just a copy of my Stinger, with just another colours haha. Same buttons, same button possition, same colours (just a little difference in brightness), and same grip.